Bloomington became a town May 11, 1858, the same day Minnesota became a state. 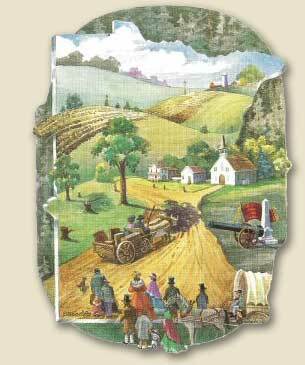 People continued to arrive in their ox carts and covered wagons; land sold for about an acre. Soon a farming community developed with its citizens helping each other. They built their barns, held quilting bees and became civic-minded with town meetings. Communication by telegraph was now available. A monument dedicated at Bloomington Cemetery on Memorial Day in 1890 honors over 50 townsmen who served in the Civil War. In 1892 a Town Hall was built near Old Shakopee Road, the former Indian trail. The Grange Hall and the Baillif general store stood nearby. At the turn of the century, the population had reached 1,000 persons.